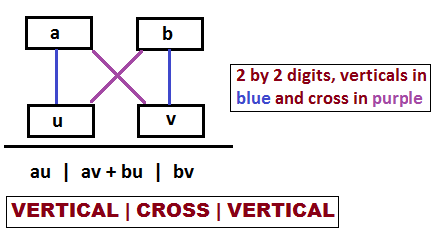 The middle parts are obtained by adding the crosswise multiplications for a and b with v and u respectively, then b and c with v and u respectively. The outer parts are vertical multiplication of a with u on the left, c with v on the right. I hope it will help in quick multiplication. If there is any query, please post it here. In next article, we shall continue to discuss this technique for multiplying three digits by three digits numbers.